For a number of years BHW supported Wilson Tayaban (PHI08). He was working part-time with ECPM and overseeing the module programme and curriculum. However in 2010 he resigned from this position as he wanted to pursue more training. His role has been divided between some of the existing team members. For more than two years, Vicente Enriques, a.k.a. Vic, was a part-time team member and he has now taken over Wilson's role, particularly attending most of the training modules and encouraging various church planting teams throughout the Philippines. His work with the Church Planting Training Programme involves the coordination and organisation of the programme, participating in the selection, screening and formation of church planting teams, providing pastoral care and coaching to the church planting teams, being involved in the evaluation and development of the training programme, and organising the regular training modules. Bright Hope World's partnership with ECPM goes back to the days of Len and Mary Savill being missionaries in the Philippines. They introduced us to ECPM, a church planting movement and BHW has been supporting various projects associated with ECPM since 2001. This partnership directly supports Vic and his family, providing some financial support for them so he can continue in his ministry with ECPM. In addition to the support from BHW, they partially support themselves by cooking and selling meals from home and Vic also helps with some translation work for another missionary for which he gets paid. The meal project is pretty profitable but they do not have enough customers at the moment so their oldest child has not been able to continue college and the youngest cannot go to school consistently either. Vic is a larger than life character with an infectious personality. He’s big and jolly and loves life and people. The rest of the ECPM team love him and he is like their father. He is practical and creates a great, positive environment around him. He seems like an ideal guy for the team and for BHW to support. Vic was saved in Saudi Arabia in 2000 while working there as an OFW. After being away in Saudi Arabia for two years he came back to the Taytay area and found his wife was a Christian as well. He found a local church and some time later got involved with the team at ECPM. He then joined a church planting team in a very poor compound and worked there for two years. It was a very violent place. Following finishing the team he volunteered part time with ECPM. Vic and his wife have five children. 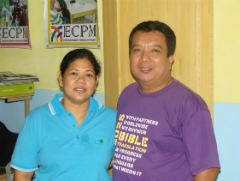 They live near the ECPM office and although part time, they are all fully engaged in ministry life. ECPM is committed to partnering with local churches in equipping potential church leaders and in planting new assemblies in unreached communities. They have a clear passion for church planting and spiritual growth and are very effective in reaching the lost for Christ and going into new areas to plant churches.